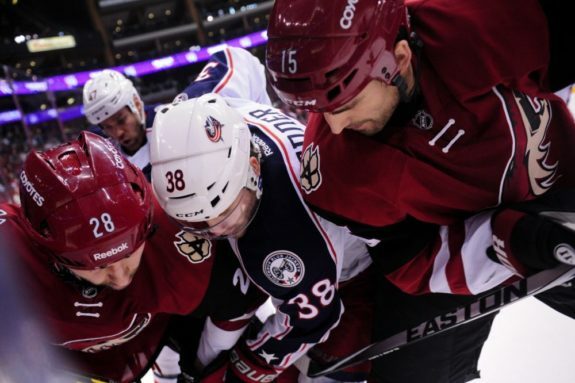 The finish line can’t come soon enough for the Columbus Blue Jackets. A promising season of hope and excitement faded into a dark abyss just eight games into the season. Any excitement for what could happen quickly reverted back to what fans in Columbus have come to know since their start in 2000. It’s another season of sheer disappointment. All season long, the team has looked for someone to step up and continue playing at a high level even though the playoffs were not in the cards. One player has stood out above all others throughout the season and even more so now. That player is Boone Jenner. It’s easy to see why Jenner is the fan favorite of many who follow the Blue Jackets. He is a relentless worker who plays hard all the time and leaves it all on the ice. Even when his team can’t keep up with their opponents, he’s a threat every time he steps on the ice. Jenner connected on his 28th goal of the season Saturday against Nashville. He now leads the team in goals after recently signing a new two-year contract extension to stay with the Blue Jackets. He embodies what Blue Jackets hockey is. He plays the kind of hockey that earns the respect of his teammates. He fights for every loose puck, while taking every opportunity to hit the opposition hard. He uses his physicality to win most battles. But he’s most importantly coming into his own in skill. What’s even more impressive is that coach John Tortorella recently moved Jenner to center, allowing him to show what he can do with more responsibility. He’s thrived in his new role, playing mostly with Brandon Saad and recent call-up Oliver Bjorkstrand. He’s also spent some time with Cam Atkinson on his wing. Jenner’s play rubs off on all his teammates. Brandon Dubinsky acknowledged this after their latest defeat, a 5-1 loss to Nashville. Because nobody else showed up tonight. This is high praise for Jenner, considering that the Blue Jackets played one of their worst games of the season. Nashville outshot Columbus 48-19 for the game, including 27-10 in the first period. The 27 shots allowed by the Blue Jackets is a franchise record for most shots allowed in a period. Outside of goalie Joonas Korpisalo doing everything he could to keep Columbus in the game, Jenner was the lone bright spot. He’s quickly turning into one of the team’s leaders, at a time where it is desperately needed. Many have considered Jenner the future captain of the Blue Jackets, and for good reason. He embodies what the Blue Jackets are about, even when the situation is less than ideal. The Blue Jackets have a keeper in Jenner. The fact that he plays like this now with nothing on the line shows the kind of player he is. He goes to war all the time. These kinds of players are far too uncommon in today’s NHL. Given the way the season has unfolded, many of the Blue Jackets veterans should take a few hours, and pop in a tape of Jenner and how he plays every shift. It’s contagious. It’s for this reason that he is as important to the future success of Columbus as anyone. He’s letting his play do all the talking. His teammates notice. In these hard times, it’s easy to look at Jenner as a reminder of how to go about your business no matter what’s going on around you. When Columbus finally turns the corner, we’ll all look back to this season and how Jenner developed. The way he has thrived this season is a great sign for the future. Now let’s see if his teammates follow his example moving forward.